David Arthur Dunbar and his staff created this very remarkable international web award program. 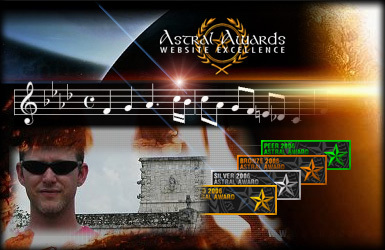 It is a pleasure for me to introduce David's Astral Awards here as the first "overseas award" to be portrayed within "EFC". "What would you like to tell me about the person David Arthur Dunbar?" By trade, I am a professional musician, and have always loved my work. I write music, draw, use oil paints, (and of course) do website design, so I am very much into creative arts. I am a project-oriented person, and love to see the finished work on everything I do. I am also very much a perfectionist, which definitely has its pros and cons! "How and when did you enter the WWW first - and when was your first encounter with Web Awards?" I started to really become web-savvy in 1996, and began designing my own websites. When I finished work on my current personal website, www.dunbarcentral.com, I started applying to many website award programs. This is when I became very interested in the whole awards community, and decided that I wanted to be a part of it. "What is it you especially like about the concept of Web Awards?" Designing a website is very much an art form. What I love about the concept of web awards is that they recognize this form of art, and reward those webdesigners who spend many many hours perfecting their websites. As a website designer myself, I know first-hand how much work goes into a truly exceptional website, and its a great honor for me to reward the hard work of others through an awards program of my own. "Is there something considering awards and the corresponding "award community" you really can't get along with?" Not really. In the three years I have been doing this, I have met lots of new people in the awards community, and they have all been wonderfully warm and helpful. "Awarding and Web Awards in general: do you have any thoughts or ideas what might be positive to happen in the future?" I think the more we reach out to one another in the awards community, the more cohesive a group we will be. This will truly strengthen our community and encourage its growth and support. I would also love to one day attend a website awards convention! Wouldn't it be great to finally meet up in person with people whom you've only ever emailed?! "What was the most enjoyable thing that ever happened to you during your time as an award master / person interested in web awards?" For me, the most enjoyable thing is being recognized by my peers for the all the hard work I have done. This wonderful invitation to be part of Fabian's El Fabi's Choice, is a perfect example. And on behalf of the entire Staff of the Astral Awards, I would like to say that it is an honor to be included on this site, especially among the many other outstanding award programs included herein. Thank you, and cheers to one and all! Jaganaud expresses his gratitude for this interview, and of course also for the possibility to portray David and his award program within "El Fabi's Choice - Selected Web Awards".